Minditude is about promoting a mindset and attitude to work that we want all of our pupils to develop. It is about children having a really strong work ethic – helping them to achieve as highly as possible in their education and also giving them attributes that they can use throughout their lives and in lots of different areas. Grit: putting in the hours, sticking at it when the going gets tough, showing the determination and tenacity to see something through. Effective: knowing how to learn, using resources, asking questions, using feedback, understanding your own strengths and weaknesses, being able to ask for help when needed, adopting different learning strategies. Motivated: having ambition, taking on challenges, having goals and aspirations, having high expectations for yourself. Switched-on: being ready to learn, listening, not fussing or getting distracted, knowing what you’re supposed to be doing, being focused and alert, being able to follow instructions. Believing It – talk about the benefits of it and let the children know you think it’s important. Modelling It – role-model it yourself and share your own experiences with pupils. 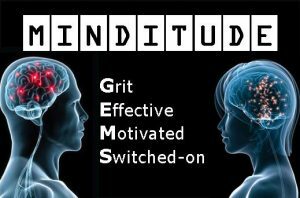 Naming It – be explicit and use the shared vocabulary: Minditude for having a good attitude and approach, The 4 Gems for reminding children of the different aspects – Grit, Effective, Motivated and Switched-On. Finding It recognise it and look for it in every activity. Integrating It make it a central part of your sessions and use it as a focal point for lessons, interventions, assemblies etc. Encouraging It praise it and give out rewards for it. Tracking It monitor the Minditude of the children you work with and ensure that it is developing over time.